Faith, multi-cultural groups and Cheshire East Council are standing together to support all communities in the borough and reinforce every resident’s right to live in safety and peace and be able to exercise their religious beliefs and faith. The public commitment follows a terror incident in which one person died and 11 people were injured, when a van was driven into a crowd of Muslim worshippers in Finsbury Park, north London, in the early hours of June 19. A 47-year-old man was arrested and later charged with attempted murder and terrorism-related offences. 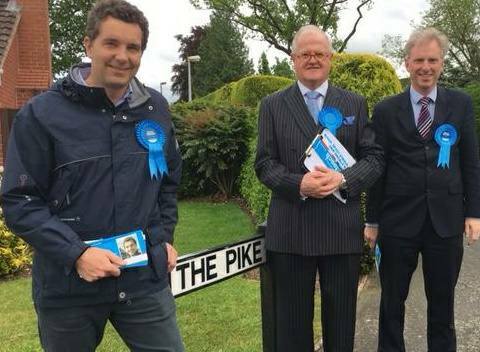 Councillor Paul Bates, cabinet member for finance and communities, said: “Every resident in Cheshire East has the right to feel safe as they practise their faith and go about their normal daily lives. “We, as a whole community, stand together, shoulder to shoulder, in these difficult times as we try to come to terms with the shock, grief and implications of recent tragic events. We should draw strength, moreover, from the knowledge that what unites us is greater than that which divides. The Rev Jennie Wakefield, chairperson of Churches Together in Crewe, spoke on behalf of faith leaders across Crewe and said: “As faith leaders from across Crewe, we offer our prayers for all those who have been bereaved, injured or affected by the recent attacks in Manchester and London. “We are united in our commitment to upholding the rights of all people to live their lives and peaceably exercise their faith, free from the fear of violence, intimidation or attack. Taurainashe Manonge, of South Cheshire Multi-Cultural Forum, said: “We would like to affirm that all our members are committed to uphold and encourage principles that foster peace and community togetherness – such as charity, respect, honour, neighbourliness and the right to dignity. People are being urged to grab the chance to learn how the north west is leading the way on developing the digital economy. Leading organisations at the forefront of this growing sector, such as the BBC, Barclays and advertising agency McCann, will explore how they are ensuring greater accessibility and reducing exclusion for all internet users. The Skills Funding Agency predicts that within 20 years 90 per cent of all jobs will require some element of digital skills to boost productivity. Cheshire East Council’s Crewe Lifestyle Centre has snapped up two more awards –making it the most successful building project undertaken by the council. The project won two out of three categories at the North West Construction Awards, in Manchester, where it was nominated by building contractors Kier, who built the leisure and community hub. The £16m centre, which brings together community services, the town’s library and state-of-the-art lifestyle and leisure amenities – all under one roof – was opened last spring, and has already collected awards for its design and community-based services. In the construction awards (on Friday) it even pipped one of the region’s major highways schemes – the A556 Knutsford to Bowden relief road, linking the M6 and M56 motorways, which has brought relief to one of the borough’s biggest traffic congestion points. The lifestyle centre, which has seen more than 750,000 customer visits since it opened in April 2016, won the ‘value award’ for delivered outcomes and ‘sub-regional project of the year for Cheshire and Warrington’. It also picked up a ‘highly commended’ in the overall ‘project of the year’ category, beating some of the region’s 40-plus large-scale schemes put forward for this event which was held at The Principal Hotel, in Manchester, and attended by around 500 guests from the world of construction, design and the public sector. Councillor Liz Wardlaw, cabinet member for health, said:: “The Crewe Lifestyle Centre has been a tremendous achievement for this council and I applaud all those people – contractors, architects and council staff – who have created this iconic leisure and community hub. In May, The Royal Institution of Chartered Surveyors voted the lifestyle centre the best for local community feedback and at the North West Local Authority Building Control Awards it picked up the ‘best public service building’ award and was runner-up in a second category. The teams behind the project, which was delivered on time and on budget, now hope for further success when it is put forward for two national award events in London in the autumn. Cheshire East Council’s plans for the regeneration of Crewe town centre have taken another step forward, following the selection of a preferred development partner for the Royal Arcade site. Following a rigorous procurement process, the council has identified Cordwell Property Group and Peveril Securities as its intended development partners. Post-tender discussions, to firm up the terms of a deal, are now being undertaken and it is expected that a formalised development agreement will be brought to the council’s cabinet for consideration in September. William Warrack, managing director of Cordwell Property Group, said: “Our proposal is for a mixed-use leisure and retail scheme, supported by a 450 space multi-storey car park and a new bus station. Cordwell Property Group is working closely with its partner Peveril Securities – part of the Bowmer and Kirkland Group – and the council to finalise the terms of the scheme. The proposed scheme would still be subject to planning consent, which will be determined independently by the council’s strategic planning committee at a future date. Councillor Stockton, Cheshire East Council cabinet member for regeneration, said: “We are focusing much of our energy in Crewe on the redevelopment of the Royal Arcade site as this will be the most important aspects of the town centre’s regeneration. “It follows on from the success of Crewe Lifestyle Centre and Crewe University Technical College, which opened last year. “However, we are mindful that there is much more that needs to be done and are developing plans for wider town centre regeneration, including options for the future of Crewe’s markets and new public realm. Youngsters across Cheshire East are being encouraged to visit their local library during the school holidays and take part in the Summer Reading Challenge. The event, which is designed for children aged four to 11, takes place annually and requires them to read six or more books of their choice and visit the library at least four times. It will run between July 1 and September 9 and children can collect special rewards each time they finish a book. Everyone who completes the challenge will also receive a medal and a certificate at an award ceremony in September. This year’s theme is Animal Agents and is illustrated by Tony Ross, who is the illustrator of the Horrid Henry books series. His illustrations for the Summer Reading Challenge feature a variety of clever creatures, specially trained to use their skills and natural instincts to unravel mysteries. Libraries across Cheshire East will be holding activities and events throughout the school holidays to support the challenge, including an animal magic party, competitions, craft sessions, storytimes and interactive talks with bestselling authors. Councillor Peter Groves, cabinet member for libraries at Cheshire East Council, said: “The Summer Reading Challenge is a great initiative and one which captures children’s imagination and helps them to discover a love of reading. For a full list of activities, please visit your local library or the library’s dedicated Facebook page. While many of the events are free, places are limited and booking in advance may be necessary. ‘Saturday Café’ is up and running at St Andrew’s Church on Bedford Street in Crewe. The café is open every Saturday from 12pm to 1:30pm. There are drinks and food including soup, sandwiches & cakes for sale. Items are available individually along with meal deals: three courses = £3 and a kid’s box = £1. There is also background music to listen to and magazines to read and a play zone for children. Everyone is welcome. The Saturday Cafe is supported by grant funding from Cheshire East's public health participatory budgeting programme. Cheshire East Council has moved swiftly with its partners in order to reassure people about the fire safety of high-rise blocks in the borough. The authority has reviewed its own buildings stock and has contacted registered housing providers to seek their assurances that any of their high-rise properties meet strict fire regulations. No properties have been identified as having the type of cladding that has been implicated in the Grenfell Tower blaze, in Kensington, London, on June 14, which led to at least 79 deaths. Council officers are also working closely alongside fire brigade officers during site visits to high-rise properties in Cheshire East. No sites of concern have been identified so far. Councillor Rachel Bailey, Leader of Cheshire East Council, said: “This council was deeply saddened to learn of the tragic events at Grenfell Tower in west London, and joins the nation in grieving for those who lost their lives. We also keep those who were injured, made homeless or otherwise affected by the fire, firmly in our thoughts. The council’s facilities management team has robust systems in place with regard to fire safety measures in council-owned buildings, which are reviewed regularly. Moreover, all council buildings have fire alarms fitted and fire drills are carried out regularly. Only one of the council’s buildings is more than six storeys tall (18m) and none of the authority’s high-rise buildings has external cladding. A briefing issued by Cheshire Fire and Rescue Service has confirmed that every high-rise building in Cheshire is regularly inspected for fire safety by the service’s prevention and protection teams, accompanied by operational firefighters. These teams have been visiting all 21 high-rise buildings identified in Cheshire in recent days, to provide extra reassurance to local people. Councillor Bailey added: “The council has joint responsibilities with other agencies, such as the Cheshire Fire and Rescue Service, housing associations and owners/tenants, for ensuring that various measures and standards are in place to ensure all buildings in Cheshire East are built, occupied and maintained to the very latest safety standards. “In 2013, following a notice of motion, this council resolved to lobby MPs to promote any change to the building regulations to consider including sprinkler systems within new or adapted buildings. Indeed, following the resolution, we installed sprinklers into our own Lincoln House property in Crewe and a programme of works is due to start in the next few weeks to install sprinklers into each unit at our homeless hostel in Macclesfield. Cheshire East Council has welcomed the announcement in the Queen’s Speech that the Bill for Phase Two of HS2, from Birmingham to Crewe, will be put before the next session of Parliament. The Bill will include the right to compulsorily purchase land and for HS2 Ltd to develop applications for planning consent. It is anticipated the Bill could be heard before summer recess. Cheshire East Council Leader Rachel Bailey said: “This announcement further justifies the business case made out by this council to bring high-speed rail into the borough, together with the enormous economic benefits this project will deliver in support of our plan-led approach to growth and to our partner councils in the wider sub-region. “I would also reiterate what I have said previously that we wish to see the highest standards of mitigation and compensation for those people and businesses affected by the route. “We will continue to press for a strategic hub station at Crewe, served by increased HS2 services to and from London, Birmingham and Manchester that will benefit from the station’s unrivalled 360-degree connectivity. In this way the economic benefits could then reach far beyond the political and regional boundaries. The Bill is expected to be put before Parliament soon so that preparation work for the second phase of the project can begin. The council will also press for high-speed connections to serve Macclesfield. Prime Minister Theresa May said the project will help ensure the economy is ‘equipped with the world-leading infrastructure it needs to benefit from the opportunities of new technology’. High-speed rail will significantly reduce journey times to and from London but its primary purpose is to increase capacity on an already overcrowded network. HS2 is predicted to arrive in Crewe in 2027 with a further phase – Phase 2b to Manchester and northern hubs – scheduled for completion by 2033. Councillors from Cheshire East Council and Crewe Town Council have laid flowers near to the site of the tragic crane collapse in Crewe. Emergency services were called to a new-build site on Dunwoody Way, in Crewe, on Wednesday afternoon following reports of a collapsed crane. Sadly, two men died as a result of the incident. One man was taken to Royal Stoke University Hospital with serious injuries, which are not believed to be life threatening. Today, Councillor Paul Bates, cabinet member for finance and communities at Cheshire East Council, Crewe Town Council Leader Simon Yates and Crewe Mayor Diane Yates laid flowers near to the scene of the incident as a mark of their respect. Councillor Rachel Bailey, Leader of Cheshire East Council, said: “I was deeply saddened to hear of this tragic incident. My sincere condolences go out to the families affected by this and I hope to write to them personally. “As a result of the crane collapse, a residential property was damaged. I can confirm that officers from Civicance, a wholly-owned company of Cheshire East Council which provides building control services, did attend the scene at the request of the emergency services to assess the damage. Cllr Yates said: “Our sympathies and deepest condolences go to the friends and families of those affected by this tragic incident on Dunwoody Way, in Crewe, on Wednesday. A planning inspector has backed Cheshire East’s Local Plan for shaping future development in the borough. It follows three years of public comments and submissions on the council’s proposed strategic blueprint for the borough’s development to 2030. The report by Planning Inspector Stephen Pratt gives the Local Plan ‘a clean bill of health’ and means the council can now move ahead with the document’s formal adoption within weeks. The receipt of the inspector’s report brings the Local Plan examination to a formal close. Importantly, his report says the Local Plan, once adopted, will secure ‘at least’ a five-year supply of housing land to meet projected need. This will provide a vital protection against inappropriate or unsustainable housing proposals from developers. Councillor Rachel Bailey, leader of Cheshire East Council said: “This is good news for Cheshire East and a major step forward for residents and businesses alike. Councillor Ainsley Arnold, Cheshire East cabinet member for housing and planning, said: “The Local Plan is the council’s most important tool for shaping development in Cheshire East to 2030 – so this is great news. “The council is grateful for the inspector’s report, which now enables us, after a lot of hard work by our planning team, to press ahead and adopt the Local Plan in a few weeks’ time. “The inspector acknowledged that our Local Plan was one of the most complex and consulted upon he had seen in his more than 20 years’ experience. His report shows that any shortcomings identified in the process have now been rectified and, with the published modifications, the Local Plan now has a clean bill of health. “There has been a tremendous response from our residents and other stakeholders during the extensive 13 rounds of public consultations on our proposals and I’m sure it has allowed everyone to feel they had the opportunity to have their say. The council received a total of more than 60,000 comments during the various consultations to arrive at the finalised Local Plan. This represents an unprecedented level of interest in a council consultation process. The inspector’s new report fully supports the approach to housing, infrastructure and employment development across Cheshire East – rejecting both more ambitious and more pessimistic assessments of future needs. The report supports the council’s strategy of making modest amendments to green belt land and also endorses the other key policies regarding the maintaining of ‘green gap’ land between settlements. The plan’s revised spatial distribution of development incorporates both the uplift in overall development and the need for additional growth in the northern towns. However, less than two per cent of the borough’s green belt land will be affected by the increased development need. Lifestyle and health services launched three months ago by Cheshire East Council’s ‘One You Cheshire East’ programme are already having a very positive impact on residents in the borough. ‘One You Cheshire East’ brings lifestyle and health advice services in the borough under one support system. It works to improve residents’ health, tackle health inequalities and reduce the load on the council and the NHS. Tom Rigby, from Macclesfield, joined the ‘Re-shape’ group – one of the programmes commissioned by Cheshire East Council’s public health team, as part of the ‘One You’ offer – at Everybody Sport and Recreation’s Holmes Chapel Community Centre when it was launched in March. Tom was finding it hard to run around the park with his kids, felt overweight and struggled to fit in his clothes. The impact of the programme has been almost immediate. Tom said: “In just 11 weeks I’ve lost more than two stone. I fit my clothes better and have actually had to go down a size in my clothes, so I’ve got more energy and feel less stressed at work. Topics vary each week from portion sizes, looking at fats and understanding more about sugars as people on the programme get a broad overview of nutrition. 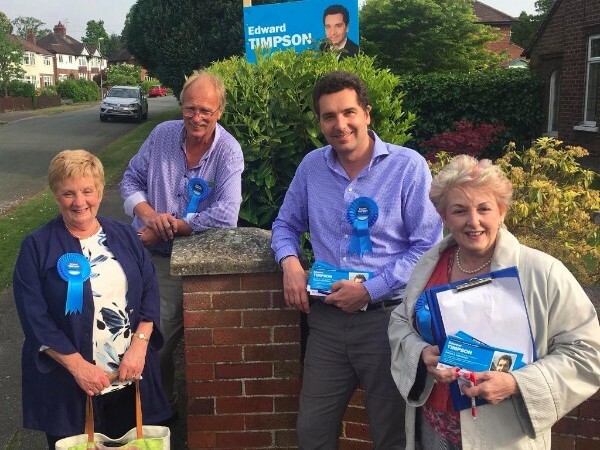 Councillor Liz Wardlaw, Cheshire East Council cabinet member for health, said: “It’s terrific to hear about the success of people like Tom who have clearly got great determination to improve their health. I hope that his story can act as inspiration for anyone who is thinking about making that first step. Cheshire East Council’s ‘get tough’ approach to littering and fly-tipping has resulted in further successful prosecutions with fines and costs totalling £1,570 for two offenders. Dr James Carey, 63, of Goulden Street, Crewe, was fined £80 with costs of £930 for dropping a cigarette in Earle Street in Crewe. He was also ordered to pay a £30 victim surcharge. Carey admitted dropping the cigarette but denied leaving it. He pleaded not guilty to the offence of littering but was convicted after a two-hour trial. In a separate prosecution, previously- convicted fly-tipper Oliver Bailey, 20, of Ruskin Road, Crewe, was convicted of two offences, for dropping and leaving cigarettes in Market Street, and at Grand Junction Retail Park, both in Crewe, in December 2016. Bailey pleaded guilty by post and was fined £185 for each offence, ordered to pay prosecution costs of £130 and a victim surcharge of £30, leaving him with a total of £530 to pay. The two cases came before Crewe Magistrates on June 14 and 15. Cheshire East Council began its ‘Keep Crewe Clean’ campaign in September, employing a team of enforcement officers to prosecute incidents of fly-tipping, littering and dog fouling. Councillor Paul Bates, cabinet member for finance and communities, said: “These court prosecutions reinforce our message that littering of any description will be dealt with robustly as we take steps to clean up Crewe, where many responsible residents have asked us to take tough action. These latest convictions take the number of successful prosecutions for litter to more than 150 since the council’s campaign began. People from across Cheshire East gathered in glorious sunshine at a host of community events to honour the memory of murdered MP Jo Cox. The Great Get Together celebrations were backed by Cheshire East Council to encourage residents across the borough to join together in their communities at the weekend to share food, conversation and celebrate what we all have in common. The events marked the first anniversary of Batley and Spen MP Jo’s murder on June 16, 2016. The council had made £15,000 available for community groups to apply for grants of up to £100 to come together and hold street parties – and 70 separate events were supported by the scheme in Cheshire East. Grants were used to provide entertainment, food, decorations, craft materials, face paints and much more. The council waived its fees for licensing and road closures for these special community events. The council also organised community events that weekend, with a fun afternoon and BBQ in Westminster Park, Crewe, drew around 800 people on the Saturday (June 17) and a pot-luck picnic and family sports in West Park on Sunday (June 18) which attracted around 400 people. Another council event at Macclesfield’s South Park also drew several hundred. Councillor Paul Bates, cabinet member for communities and health, said: “A fantastic community spirit was shown right across the borough at a host of wonderful Great Get Together events, supported by the council, celebrating life and diversity in memory of Jo Cox at the weekend. “Now, more than ever, we need to show support for our whole community and it was great to see so many people getting involved and meeting people from their neighbourhoods that they might not already know. “As well as campaigning around diversity and human rights issues, Jo was also concerned about loneliness, which is an issue in our towns and rural areas. Cllr Bates volunteered to be put in ‘the stocks’ and pelted with wet sponges at a Great Get Together event in Congleton on Sunday – raising £400 for the Ruby’s Fund charity for disabled children. The council received successful grant applications from a range of community and neighbour groups including a Carers Great Get Together in Knutsford, The Great Get Together Tea Dance in Congleton, Cake and Craft Get Together in Scholar Green, Great Gardening Get Together at Allotments all over Cheshire East, Homestead Street P-A-R-T-Y in Macclesfield and Balfour Buffet and Barbecue in Crewe – plus many more. Members of Seahorse Swimming Club, who are based at the Lifestyle Centre in Crewe, got involved with The Great Get Together on Sunday 18th June 2017, with a morning walk followed with a picnic. The walk was from Queen's Park to Nantwich (along the Greenway) and then back to the park for the picnic. Some took part in a less energetic walk around the park. Neighbourhood celebrations were taking place throughout the UK during the weekend to bring communities closer together. This was the inspiration of Jo Cox, who was tragically killed on 16th June last year. "The day was a huge success. Everyone enjoyed the social aspect of the event and participating in exercise. Those who got involved stated how they enjoyed the challenge of the walk. Others loved the fun of playing racket games in the park and entertaining each other, while some were pleased to spend time in the lovely surroundings of Queen's Park. The weather was glorious and it was pleasing to see the refreshments going down so well by everyone." - Gareth Roberts (Seahorse Secretary). Ansa is fully committed to training and developing opportunities for staff to ensure such levels of long service and dedication continue and currently operates a highly successful apprenticeship programme. For further information, please visit www.ansa.co.uk. This brings Vicki a new challenge, so firefighters, staff and volunteers are fundraising to help with the cost of home and vehicle adaptations and other expenses to help her to live her life to the fullest. Cheshire East Council has jointly commissioned an artist to decorate vacant shop windows to boost Crewe town centre. It follows close collaboration with Crewe Town Council and local schools and community groups. Ruth Piggott was successfully selected over numerous applicants to produce artistic designs for empty shop units in the town centre, having presented a strong case to reinvigorate these with a series of creative and visual displays. To produce these designs, Ruth, founder of ‘Curiosity Creators’, engaged with school children from The Oaks Academy, adults from Alsager Partnership’s Memory Café and members of Crewe Heritage Centre. All who participated helped to create and produce a series of Crewe-related visual images, displayed in the form of bunting. The window frames for the project were inspired by railway arches and Crewe’s Municipal Buildings. The artwork can be seen in both units on 1-11 Tower Way and number 36 Victoria Street. They are just some of the many new designs appearing to decorate vacant units in the area. These include the current vinyl projections from the Crewe Engineering and Design UTC and Crewe Lyceum. The art and vinyl displays in the town centre are part of many initiatives that are being introduced in order to breathe new life into Crewe and fall under a wider, longer-term regeneration strategy that has started to be implemented. Councillor Don Stockton, cabinet member for regeneration at Cheshire East Council, said “Whilst this is just an interim measure before the redevelopment of the Royal Arcade commences, it is a fantastic example of the work we are undertaking to involve the local community in the regeneration of Crewe. Working alongside Cheshire East, Councillor Benn Minshall, deputy leader of Crewe Town Council, also echoed the importance of this latest project. He said “We’d like to thank everybody involved for their fantastic creative contributions and hard work for this project. It is most important to us that the local community here have had a direct impact on the quality of their town centre. These latest projects come following the introduction of a series of successful measures in Crewe this year, including temporary free parking, the new Crewe Cosmopolitan Food Festival and a host of cultural and social events that are coming to the town later this summer. Crewe, Cheshire: As trAction Crewe gains momentum, more exciting activities join the line up of FREE Family fun on the 8th and 9th July. Located at the covered outdoor market Science Corner is the latest addition to trAction Crewe, and will feature engaging STEAM based (Science, Technology, Engineering, Arts, Manufacturing) workshops; with inspiring activities for all ages to enjoy . trAction Crewe is a futuristic weekend of FREE fun for the whole family to enjoy that comprises a vast range of activities, including astronauts flying high into the air, SoundAvan and stunningly beautiful arts activities and performances, thanks to Arts Council England and Cheshire East Council funding to bring this exciting arts activity to Crewe. “We are delighted to take part in trAction Crewe and engage with the community that we serve. It is such a good initiative for attracting visitors and developing new audiences coming into Crewe Town Centre. This will invariably help to raise the profile of Crewe locally, as well as putting Crewe firmly on the cultural map”. Chair of the Community and Environment comity, Cllr Minshall comments, “We are thrilled to have so many local and national organisations on board with trAction. With their help and support we can truly bring the community together in a fantastic celebration and make trAction a real sensory experience”. Cllr Minshall concludes, “It is fair to say that we anticipate that trAction will be one of the biggest festivals of its kind across Crewe and South Cheshire, and we hope to attract big crowds to join in with the family fun. We are very grateful to all our supporting partners, and wish to offer them a big thank you, who will be making Science Corner a real futuristic STEM experience, including Crewe Engineering and Design UTC, South Cheshire College, Higher Horizons, Tebbits & Co Solicitors, Reaseheath College, SHIFT and Cheshire East”. SpareParts festival will also join trAction Crewe this year, with stupendous arts and performance activities including everything from urban parkour to Guinness World Record Holders BMX performances, all funded by Arts Council England and Cheshire East Council. SpareParts festival will also be on the move and landing into Fleetwood at TramSunday on the 16th July. For more information visit www.tractioncrewe.co.uk and follow trAction Crewe social media to stay up to date with all the latest announcements with tag @TrActionCrewe #Gearup. Cheshire East Council will be shining the spotlight on its services at two of the borough’s largest agricultural events. The council is proud to be a major sponsor of The Royal Cheshire County Show, in Tabley, near Knutsford, and the Nantwich Show, based at Dorfold Park, and will be welcoming visitors to its stand at both events. The theme of this year’s council stand will be the authority’s 500 services, with interesting facts and figures and an ‘A-Z of the council’ forming part of the display. There will also be a prize draw, deckchairs for visitors to sit back and relax on and an array of council vehicles, including a gritter, compact road sweeper, mobile children’s centre, mobile library, a countryside ranger service vehicle and a vehicle from Transport Service Solutions, a Cheshire East Council arms-length company. Staff from the council’s fostering team and arms-length Skills and Growth Company and Transport Service Solutions will also be in attendance. Councillor Janet Clowes, Cheshire East Council cabinet member for rural affairs, said: “Every day our staff work hard to provide more than 500 services, helping to make Cheshire East a great place to live, work and visit. The Royal Cheshire County Show takes place on June 20 and 21 and the Nantwich Show is open to the public on July 26. Visitors planning a journey to The Royal Cheshire County Show will benefit from a free bus service to and from the showground, which has been funded and organised by the council. The service will run to and from Knutsford and Hartford railway stations. Community groups and neighbours from across Cheshire East are set to celebrate ‘The Great Get Together’ this weekend to honour the memory of murdered MP Jo Cox. The council made £15,000 available for community groups to apply for grants of up to £100 to come together and hold street parties and community events. The aim was to encourage residents across the borough to join together, in their communities, to share food, conversation and celebrate what they have in common. The events on Saturday June 17 and Sunday June 18 will mark the first anniversary of the murder of Batley and Spen MP Jo Cox on June 16, 2016 and will celebrate her belief that we have more in common than divides us. A total of 67 grant applications were successful and the council is also supporting two larger community events in Crewe and Macclesfield. ● Fun in the Field, outdoor picnic concert – Wrenbury, field next to campsite on Cholmondeley Road, 2pm-10pm, Saturday June 17. Grants are being used to provide entertainment, food, decorations, craft materials, face paints and much more. The council also waived fees for licensing and road closures for these special community events. ● Macclesfield – Pot-luck picnic and family sports, in West Park, on Sunday June 18. Councillor Paul Bates, cabinet member for communities and health, said: “There is fantastic community spirit right across the borough and this weekend promises to be great fun for everyone. “There are street parties, afternoon teas, sports, crafts, music and dancing events, celebrating life and diversity in memory of Jo Cox. Now, more than ever, we need to show support for our whole community and get out and meet people in our neighbourhood that we don’t yet know. “As well as campaigning around diversity and human rights, Jo was also concerned about loneliness, which is an issue in our towns and rural areas. If you are holding or attending an event, perhaps think about whether there is someone who lives on their own in your neighbourhood, who would appreciate being asked to come along and join in. Posters designed to educate and warn people about environmental crimes have been translated into five different languages as part of Cheshire East Council’s ‘No Rubbish Excuses’ campaign. The campaign, which was launched in April, is part of the council’s efforts to tackle fly-tipping, littering and dog fouling, with activities primarily targeted at six fly-tipping ‘hotspot’ zones in Crewe. Hard-hitting signs and stickers have been visible in those areas for several weeks now, including on alley gates, dog waste bins and litter bins, as well as around parks and the town centre. Bus and billboard advertising has also begun and will last for several weeks. To ensure the campaign’s important messages about waste disposal reach as many residents as possible, the council has now had many of the campaign materials translated into Bengali, Brazilian Portuguese, Slovakian, Romanian and Polish. The languages were selected based on resident information collected during digital surveys in Crewe, which were carried out in the fly-tipping hotspot zones at the beginning of the year. All of the posters are available to download from the council’s website and are also being distributed to various places across Crewe. In addition, targeted social media posts, professionally translated into the five languages, will be sent out over the coming weeks on Twitter and Facebook. Both the campaign materials and social media messages have been produced with involvement from local residents and community groups. Councillor Paul Bates, cabinet member for finance and communities at Cheshire East Council, said: “It’s important that all our residents have access to the correct information about responsible waste disposal and are aware that fly-tipping, littering and dog fouling are all environmental crimes and carry penalties. “It is also important that all residents know how they can report incidents and information to us, so that we can work towards successful prosecutions. The posters are available to download from the council’s website by visiting: cheshireeast.gov.uk/norubbishexcuses and clicking on the ‘There are no rubbish excuses’ tab. A cross-party working group of community members has met to resolve concerns over the use of Barony Park in Nantwich as a transit site. A partnership of councillors from all parties and officers from Cheshire East and Nantwich Town Council, together with Cheshire police officers and residents’ representatives, met recently to address the issue of travellers setting up encampments on Barony Park. Councillor Paul Bates, Cheshire East Council cabinet member for finance and communities, said: “All partners are aware of this matter and how it impacts on local communities and are working together to explore possible solutions. “At the meeting, the council and partners demonstrated their commitment to working with local people to address the public’s concerns. Once these options have been investigated, Cheshire East will then consult with local residents to gain their views on the proposals. Seahorse Swimming Club, which caters for people with disabilities, and is based at the Lifestyle Centre in Crewe has been honoured by royalty with the Queen’s Award for Voluntary Service for 2017. The award recognises the work of the volunteers and is the highest award given to local volunteer groups across the UK for outstanding work done in their own communities. The award was created in 2002 to celebrate the anniversary of the Queen’s coronation and the presentation of the award is made by the Lord Lieutenant, on behalf of Her Majesty The Queen. Volunteers, Jackie Roberts and Steph Evanson (pictured), recently attended the Royal Garden Party at Buckingham Palace, and were thrilled to represent Seahorse at such a prestigious event. “Everyone at Seahorse is immensely proud. The award is wonderful recognition of the dedication of all the volunteers at Seahorse, which celebrated its 60th anniversary last year.” - Gareth Roberts, Secretary, Seahorse Swimming Club. “Our thoughts and prayers go out to all those who have lost loved ones and have been affected in other ways by this terrorist attack. “The attack in London, on Saturday night, was both pointless and horrific. “We will be writing to civic leaders in London to express our own and the borough’s condolences. “In Cheshire East, all council buildings will fly flags at half mast and we would urge businesses that have their own flags to do the same. We would also urge all residents and businesses to be vigilant. If people see anything suspicious, they should report it to the police. “The council will continue to work with partners and communities to seek to ensure the safety of our residents. Crewe, Cheshire; trAction Crewe will be a blast with recently announced activities including: build your future car, ‘Crewecraft’, free bouncy castles, and smoothie bike activities, all taking place at the Crewe Lifestyle Centre and Crewe Library. trAction will take place 8th - 9th July, and will offer fun activities for the whole family for FREE. The whole town is gearing up for the futuristic science and movement festival, with an exhilarating artistic programme put on by SpareParts festival, and countless workshops and activities, the atmosphere will be electric. As part of SHIFT, celebrating digital discoveries across Cheshire East, a ‘Crewecraft' workshop will be featured at trAction in Crewe Library on a Saturday 8th July. Join digital artist, Gemma May Latham, and a group of young Minecraft builders to explore the heritage of Crewe through the blocky world. Throughout the series of workshops, you will be able to recreate archival town plans and architectural drawing from the Cheshire Archives, within the well-loved Minecraft game. The completed Minecraft World will become a tool for sharing the Heritage of the town as a resource in Crewe Library, and will bring to life the heritage of Crewe. This fab workshop has been funded by Heritage Lottery Fund and Cheshire East Council, and everyone is welcome to come along and enjoy it for FREE – book through the library to secure a place @discoverSHIFT. Cheshire East Council deputy leader Cllr David Brown, comments “This project will enable young people to become engaged in the history of Crewe town centre, while taking part in a fascinating educational project.” Workshops will take place at Crewe Library together with a number of public events, including Crewe’s trAction Festival in July. Cllr Brown continues, “The whole project is encompassed within the Council’s SHIFT programme, which celebrates and promotes digital learning, skills and development across the borough for all age groups”. Crewe Library and Lifestyle Centre will be action packed, with ‘Design Your Future Car Competition’ also joining trAction, and taking place on Saturday 8th July at Crewe Library. Children aged 5 - 11 years old will have the opportunity to build their very own personalised cardboard box car and enter it in a competition for FREE. Competitors will be able to take their unique designs for a spin on the specially built test track and take part in the award ceremony supported by Bentley Motors at 1:00pm. Bentley Motors will judge the best car and provide prizes for the winner. Head down to Crewe Library on Saturday at 10:00am or 11:30 am to build your own cardboard box car. Crewe and Nantwich Library Manager, Thomas Appleby comments, ”Crewe Library is really excited about being involved in this year’s Crewe trAction weekend. The library will be really busy with special events like the future car activity, and Minecraft sessions. It's great we can host these events for the Crewe Community and hope to see lots of people attending. It promises to be a great weekend!" Also available on Saturday is a smoothie bike and bouncy castle in the Lifestyle Centre sports hall, from 12:00pm - 4:00pm. Sunday’s activities include the bouncy castle and the smoothie bike from 10:00am - 4:00pm. trAction Crewe will host a whole range of activities, which is FREE fun for the whole family to enjoy. For more information please visit www.tractioncrewe.co.uk and keep up-to-date with all the recent announcements with #Gearup. Welcome to my 177th news bulletin! The Prime Minister, Theresa May, has launched the Conservative Party's 2017 General Election Manifesto—'Forward, Together: Our Plan for a Stronger Britain and a Prosperous Future'. This detailed plan offers a clear vision for Britain not just for the next five years but for the years and decades beyond. It is a programme for government and a declaration of what we intend to achieve—with big, sometimes difficult, and long-term decisions that are right for our future and for future generations. You can read more in my local manifesto newspaper by clicking here. 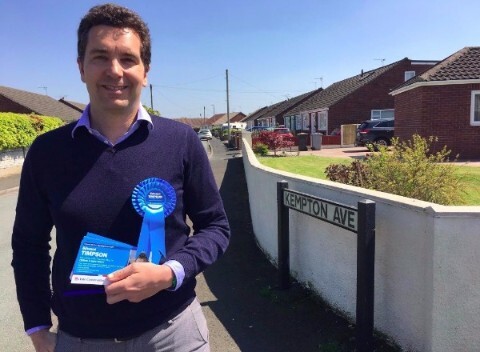 Our manifesto also contains a welcome commitment to education, and to my campaign for fairer provision, by confirming that, under a Conservative Government, no Cheshire East school will see its budget cut as a result of a new funding formula. This, as I am sure you will all agree, is fantastic news for our schools, and shows that quiet, calm and concerted lobbying can yield real results for local residents. 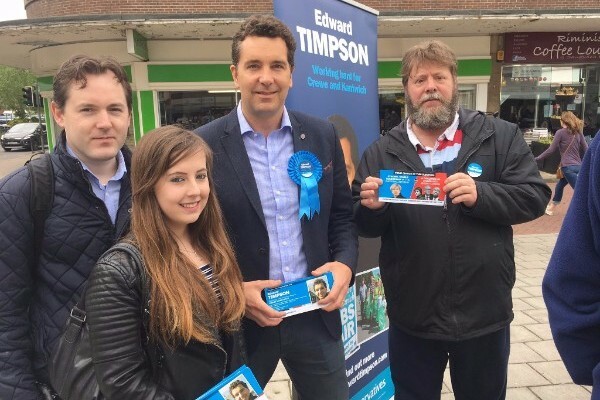 You can read the full Conservative General Election Manifesto here. I am delighted that my campaign to convince the Education Secretary and the Prime Minister that school funding in Cheshire East needed to be fairer has been a success. Not only has it been a success in Cheshire East, but it has been a success across the country, ensuring no school has its budget cut as a result of any new funding formula. An extra £4 billion will also be given to schools, as confirmed by the Conservative Party 2017 General Election Manifesto. 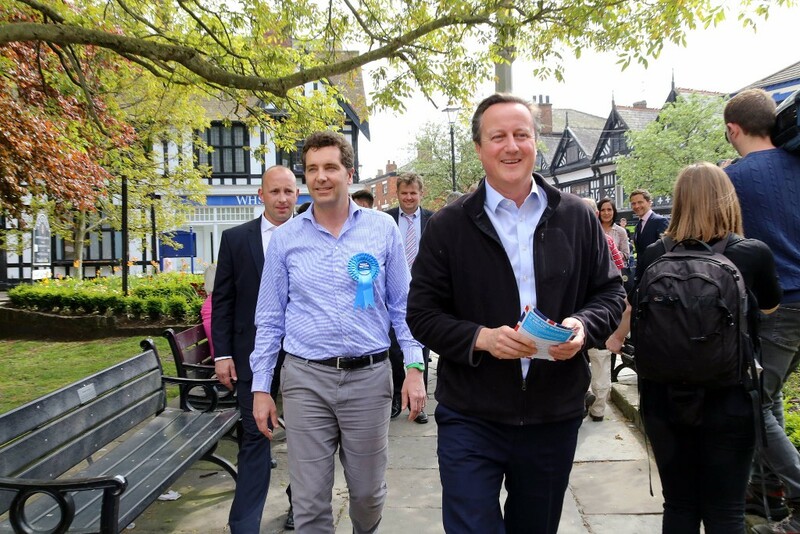 I would like to congratulate Theresa May for listening to my concerns, the other Cheshire Conservative MPs who campaigned with me, and all the teachers and parents who took the time to respond to the Government's public consultation. Thanks to everyone who has stopped for a chat in the constituency over the past few weeks. It has been great to hear your thoughts on both local and national issues. If we're yet to meet, do feel free to get in touch via my feedback form here. My thoughts and prayers go out to the victims of the horrific terror attack in Manchester, their families and their friends, and I know local people share this sentiment. Cheshire Community Foundation have set up a fund following the attack, with all monies raised going to help the victims and families. You can make a donation to this fund by clicking here. Messages from families from 90 miles away praised staff and students, the range of activities and the organisation of the event. Headline acts included The Company of Horsemen, who thrilled spectators with a stunt riding show, and Team Extreme, whose BMX stunt riders and skaters gave an exciting performance of acrobatics on wheels. Other activities included tours of Reaseheath’s progressive technical training resources such as its Centre for Horticulture, Environment and Sustainable Technology, and its Food Centre. Visitors also learned about the college’s current £31 million investment in new halls of residence, Sports Science and Performance Academy and an Advanced Agricultural Technology and Engineering Centre. 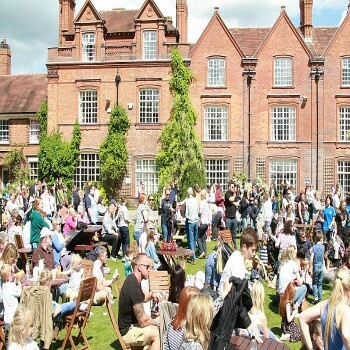 Reaseheath Principal Meredydd David said: “Our annual festival continues to amaze all that attend and this was Reaseheath at its very best. "Our Family Festival gave visitors a fantastic day of activities, demonstrations and displays which were packed with fun and enjoyment and demonstrated some of the skills our fantastic students have". UK unemployment has fallen to its lowest level since 1975, as a record number of job vacancies are on offer, new figures show. The UK jobless total fell by 53,000 in the period January-March 2017, and 152,000 across the year. 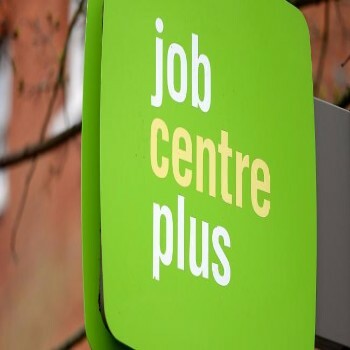 There are now over 31.95 million people in work in the UK - 122,000 more than for October to December 2016 and 381,000 more than for a year earlier - and the employment rate (the proportion of people aged from 16 to 64 who were in work) is at 74.8%, the highest since comparable records began in 1971. Vacancies are also up, with strong growth in accommodation and food services sectors. In Crewe & Nantwich, the claimant rate - at 2% - is significantly lower than regional and national averages. 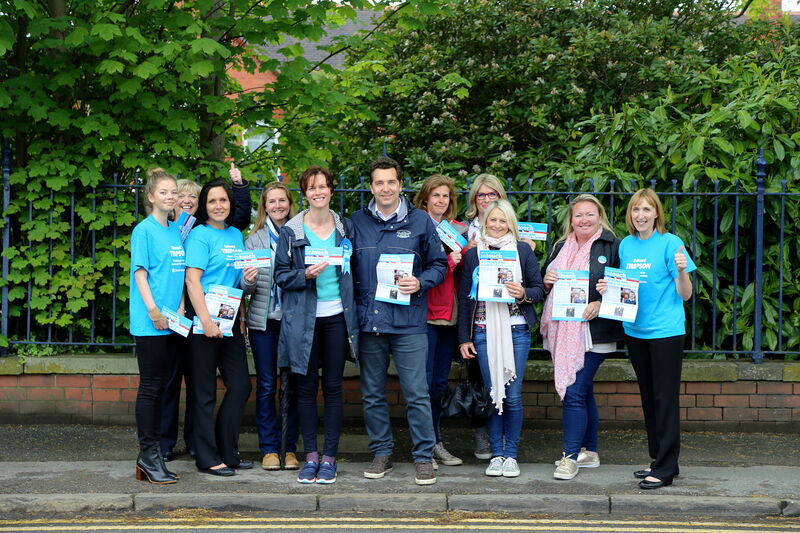 Proposed budget cuts for Cheshire East schools were outlined in a consultation document earlier this year, and this stirred parents and Cheshire MPs alike to lobby against the changes. met Justine Greening, the Secretary of State for Education, and Nick Gibb, the Minister for School Standards, in January and March, and followed this with a meeting with the Prime Minister, Theresa May, in April. 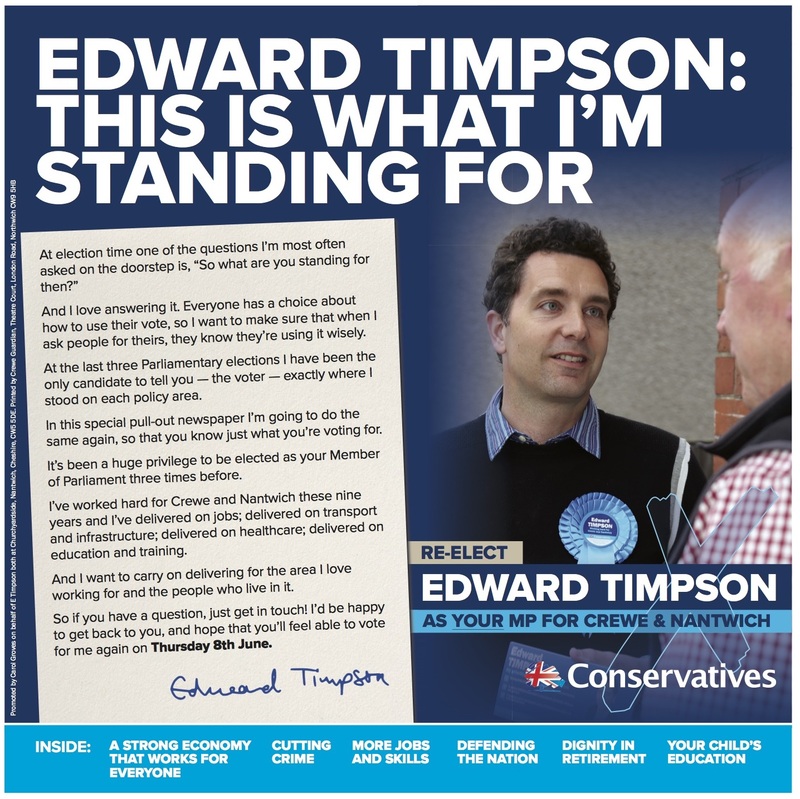 “It became clear to me at an early stage that it needed to be fairer for Cheshire East, so I started a programme of formal and informal lobbying on the issue in Westminster, as well as encouraging as many of my constituents as possible to respond to the consultation. 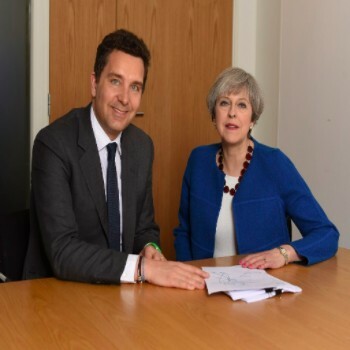 "In addition to raising the issue with colleagues at the DfE, I also felt compelled to make representations to the Prime Minister and her policy-makers. "I know how distressing these proposals were to parents, so I am delighted with my party's commitment to protect existing budgets, and its promise to invest a further £4 billion in our national school system". A project to get more people cycling for fun, health and to reduce car usage was launched this week in south Cheshire. The project is the idea of Audlem and District Acting Positively for Transition (ADAPT) – a group of local volunteers. The group have already published 30 routes which can be used by cyclists of all abilities. ADAPT are committed to finding ways to enjoy living well today while safeguarding the future, encouraging more people to use their bicycles for both leisure and local journeys. Funding for the project came from Cheshire East Council’s participatory budget scheme, which allocated £400,000 from the authority’s public health budget for local projects that improve the health of people living in their community. To receive their £3000 grant, ADAPT presented their case and won support from 200 local people who attended the Nantwich and rural area participatory budget event held in January this year. The maps also include other useful information such as where to eat and drink locally, places of interest, using towpaths and bridleways, advice for cycling safely and ways in which cycling can help with keeping healthy. ADAPT also run regular group cycle rides which follow the routes. All of the maps can be downloaded via the Audlem Online community website. Printed copies are also available from the bike restoration room at St Paul’s Centre, High Town, Crewe, Crewe Lifestyle Centre and various pubs, cafes, shops, churches and the Overwater marina in Audlem. Leaflets will be distributed in Nantwich town centre very soon. File downloads are also being made available on the website shortly so that people can load maps into their cycling apps on mobile devices. Councillor Paul Bates, cabinet member for Finance and Communities, said: “I am thrilled to see another public health project come to life and benefit the local community. “I love cycling and you always get a buzz to find a new route that you didn’t know about, especially when much of the riding is on the network of tracks and quiet lanes that we are lucky to have in Cheshire. Developers and their designers are now required to follow a new design guide to maintain a high standard for future housing schemes and developments across Cheshire East. The Cheshire East Residential Design Guide has been formally adopted and launched to benchmark housing quality across the borough. The guide is intended to ensure that all new developments achieve a high quality of design, reflecting local distinctiveness and characteristics, including the type of materials, natural features, surroundings and other connections with the locality. The guide is a key Supplementary Planning Document, supporting the current and emerging Local Plans. All new developments will be required to meet acceptable design standards to create high-quality, well-designed places. The recommendations within the guide are tailored to be applied to future developments across the whole of the borough, in urban as well as rural communities. The final document incorporates refinements arising from an eight-week consultation in 2016, involving 12,000 people, including developers, parish and town councils, designers and amenity groups. Frank Jordan, executive director for place, said: “This design guide will help to set a benchmark for quality and a ‘sense of place’. “While we want to see more imaginative developments that are pleasing to the eye, we would like to see designs that reflect the characteristics of the town, village and community in which they are situated. “Where development is not of the requisite quality, then the design guide, in support of Local Plan policy, provides justification to refuse permission as part of the planning balance. “Now adopted, it will form a material consideration when determining planning applications for new housing development. “The guide not only addresses the appearance of new housing, but also sets out a framework for an entire development, including landscaping, paving materials, public realm and open space. It also makes recommendations on waste and recycling provision, thermal insulation and performance, and other aspects of sustainability that contribute to a quality of life. The guide is aimed at a range of users, including the council, communities, developers and their design teams. A limited number of reference copies of the guide will be available at council offices and at public libraries. The first new pay-and-display machines were introduced in Crewe today and will provide a variety of quick and simple ways for people to pay for their parking. The new machines will be far more robust and reliable and in time will accept all methods of payment, except banknotes. The machines accept both £1 coins currently in circulation and will also be able to take contactless payments. Motorists will still be able to pay for their parking via the RingGo mobile payment app. Chip and pin for both debit and credit cards will soon be available as a means for payment. As the old machines are unable to accept the new £1 coin, the council took the decision to start installing the new meters early and will address the issue with card payments as soon as possible. Card payments are expected to be available during June. 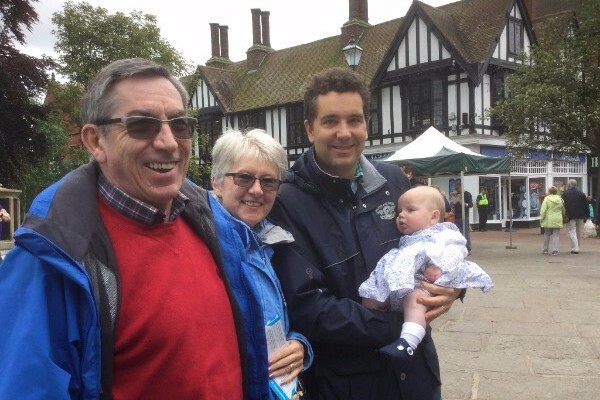 Councillor David Brown, Cheshire East cabinet member for infrastructure and highways, said: “The old parking meters had been in circulation for a very long time and we needed to modernise our parking offer. “We are starting to instal the new meters in Crewe today and will be continuing the installation programme across the borough over the next six weeks. Cheshire East Council is supporting the introduction of a new, standardised packaging for all cigarettes in order to effectively promote the dangers of smoking. These regulations came into force on May 20, and consist of larger health warnings which must cover 65 per cent of the front and back of packaging, one standardised brown-green colour and the prohibiting of misleading information on packaging, such as ‘low-tar’ or ‘organic’. This is alongside the discontinuation of cigarettes being sold in packets of less than 20. Cancer Research UK confirms there is evidence that removing branding from cigarette packs reduces their attractiveness to children. So this alteration to packaging aims to combat the two-thirds of smokers who take up the habit before they are 18. Smoking causes around 50 per cent of deaths from lung cancer, 80 per cent of deaths from bronchitis and emphysema and 14 per cent of deaths from heart disease. Any measures taken to reduce this death toll will greatly benefit the health and lifespan of people. Due to the difficulty some find in stopping smoking, Cheshire East Council has set up ‘One You Cheshire East’ stop smoking services to provide free, friendly advice and support to local people. ● People who have been in hospital and have recently been discharged. As a patient you will find quitting makes you less prone to infection, helps you recover more quickly and your wounds heal better too. Fiona Reynolds, director of public health at Cheshire East Council, said: “These new regulations are a positive step towards combating the serious health risks associated with smoking. To receive help and advice from One You Cheshire East, all you have to do to qualify, is to live in the borough and be over the age of 12. To speak to someone about quitting smoking, please call 0800 085 8818, or visit the One You website at: www.oneyoucheshireeast.org. Residents are also urged to take the online quiz on the website, to assess their daily lifestyle and advice on how they can improve their health. Old school BMX bike fans converged on Crewe on Saturday 27th May 2017 for a social ride in and around the town. Over fifty people gathered at Crewe railway station in the morning for the annual 'Chesh-Air' event, organised by the ‘Crewe and Cheshire old school BMX’ group. They rode from the station to The Manor pub for breakfast, onto The Woodside pub, and then took a tree-lined route along the Wonderful Wistaston path to The Rising Sun pub. Participants showed off their impressive BMX skills at the Platform 1 skatepark and the Shanaze Reade BMX track at Tipkinder Park. They rode racing and freestyle vintage BMX bikes from the 1980s as well as modern BMX bikes. BMX brands represented included Ammaco, Diamond Back, GT, Haro, Hutch, Kuwahara, Mongoose, Puch, Raleigh, Rebel, Redline and Torker. 1st, 2nd and 3rd prize trophies were presented for the best bike. Gary Mcbride designed a commemorative sticker, containing a grinning Cheshire Cat, which was given to each BMXer. The event was open to all and bikers ranged in age from children to adults. There were participants from Crewe along with visitors from further afield including Sandbach, Nantwich, Woore, Cambridge, Clitheroe, Halifax, Middlesbrough, Norwich, Peterborough, Stockport and York. The ride finished in the afternoon with a buffet meal at The Hop Hole pub. 'Chesh-Air' was organised by John Collins from Crewe, who rode his custom-built GT blue & chrome BMX bike. John said, “We once again had a great turnout for this years 'Chesh-Air' event. It was great see such a fantastic array of BMX bikes. I hope everyone enjoyed the ride and chat. We are always looking for new members, so please get in touch and join us on our next ride."